Safety is perhaps the most important aspect of early education and two way radio walkie talkies can help you prepare just in case an emergency does occur. Two way radios are portable and can be taken from the classroom to the lunchroom to the playground, insuring that quick communication is readily available if a threat or injury takes place. Quickly responding to and handling threats and injuries takes one push of a button on your radio. 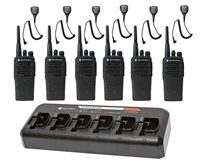 Communicating assistance with messes in the lunchroom or bathroom, monitoring the children on the playground, or needing a coworker to watch your kids if you need to step out of the room for a second are all benefits of two way radios. Earpieces allow you to hear the message and communicate back clearly even in noisy environments. Make safety a priority in your school by investing in two way radios today.